I finally received my copy of Emergent Strategy (a birthday gift from my beloved) and I’m already underlining basically every word. I have been following adrienne maree brown‘s work for some time now, ever since I had the privilege of meeting her more than ten years ago at a week-long Direct Action training organized by the Ruckus Society. She is a powerhouse of information and inspiration, of sacred strategy and irreverent insurgence. Her book is everything right now. Hop on over to a local bookstore and get yourself a copy. Emergent Strategy has me meditating on so many things, and in many ways is an invitation to return home to some of the earliest teachings I received while on the path of yoga and transformation. Specifically, the opening passage I shared in this post has me thinking about the practice of looking for the good. It is a radical practice – in the context of disaster capitalism, white supremacy and patriarchy – to train ourselves to first see beauty, connection, and Light. It is a spiritual practice to choose first to see the ways that we are connected, brilliant, and always/already whole and complete. While it might be a relatively basic or subtle shift, it is anything but simple. Join me in class tomorrow while we exploring the deeply spiritual and transformative potential of learning to meditate on the magic…to look for the good…to focus first on possibility and potential. 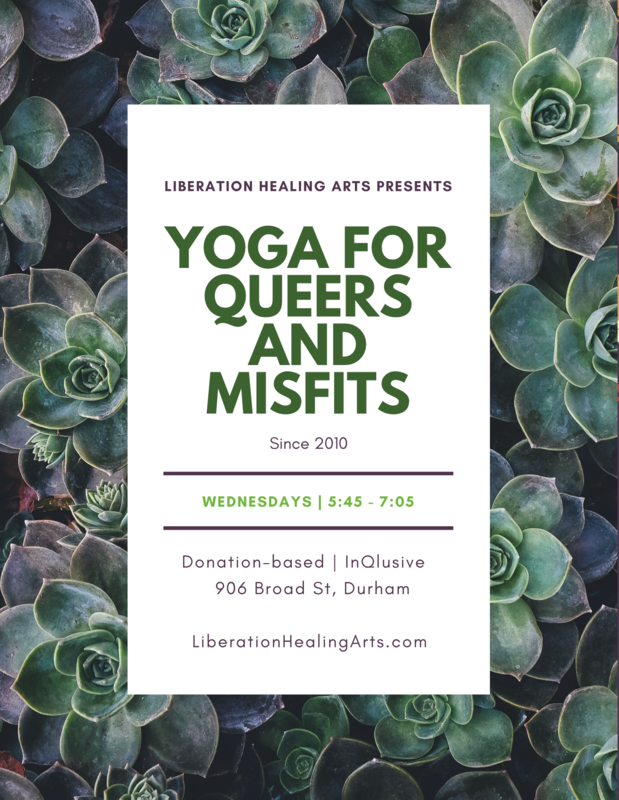 This entry was posted in Uncategorized and tagged all-levels yoga, anti-oppression, community-care, durham yoga, lgbtq, lgbtq yoga, mixed-level yoga, patty adams yoga, queer yoga in durham, self-care, social justice, yoga, yoga for all, yoga for queers and misfits, yoga for trauma healing, yoga in durham. Bookmark the permalink.